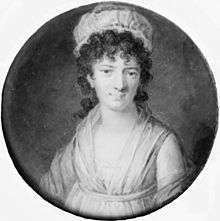 Magdalene Charlotte Hedevig Schimmelmann (10 August 1757 – 2 December 1816) was a Danish noble woman and salonist. Magdalene Charlotte Schubart was born at Fossum in Skien, Norway to Lieutenant Carl Rudolph Schubart (1714–59) and Inger Løvenskiold (1732–1808). On 25 May 1782, she married the statesman Count Ernst Heinrich von Schimmelmann (1747–1831). After the coup d'état against Ove Høegh-Guldberg in 1784, he became Minister of Finance until 1813 and later Prime Minister. Her salon was organized according to the French pattern and was renowned abroad. The latest developments in science, politics and culture were discussed. She considered it a profession to be a salonist. Her salon gathered philosophers and politicians, and played a part in the country's political scene. It was inspired by a form of "aristocratic humanism", and by the ideas of the French revolution in 1789. Her husband opened schools, which she protected, and argued for the abolition of slavery, even though they owned plantations in the Danish West Indies. The Schimmelmann family became the richest family in Denmark in the 18th century largely due to the sugar trade with the West Indies. Until 1807, her political circle of ministers earned money by trading with countries involved in the Napoleonic wars, which made her salon considered to be a center of political corruption, which made it unfashionable. ↑ "Charlotte Schimmelmann (1757 - 1816)'' (Dansk Biografisk Leksikon)". Kvinfo.dk. 2003-05-15. Retrieved 2012-05-05. ↑ "Heinrich Carl Schimmelmann'' (Store norske leksikon)". Snl.no. Retrieved 2012-05-05. This article is issued from Wikipedia - version of the 4/5/2016. The text is available under the Creative Commons Attribution/Share Alike but additional terms may apply for the media files.